/ Comments Off on Is It Time to Replace Your Garage Door Opener? Garage door openers last a long time. They are one of the most reliable devices in a home. Seldom do they malfunction, and it’s not often that one wears out. If an opener does quit working, give us a call. We can often repair it. Why would you ever want to replace an old opener that still works well? That would be a waste of money, right? Maybe not. Newer openers offer advantages in safety and security. Some are more convenient, too. 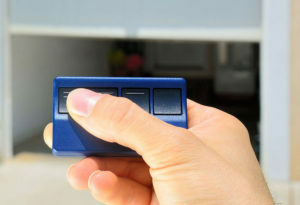 Consider the following advantages of a new garage door opener. Automatic reversal systems save lives. Reversal systems use sensors mounted about 6 inches from the ground on either side of the door. The sensors detect objects in the path of a closing door. When an object is seen, the door stops and goes back up. A door without this safety mechanism can trap and kill. The U.S. Consumer Product Safety Commission requires that garage door openers have both a reversal system and an entrapment protection system. If your door was manufactured after about 1993, it should have both of these safety features. Ponderosa can check your opener to ensure it’s equipped with working safeguards. You can test your door’s sensors, by placing a roll of paper towels under the door. If the door doesn’t stop and reverse, call us for an adjustment. Newer openers have better anti-theft features. They automatically change the remote code with each use. Older garage door openers have a fixed code. Thieves can gain access to your home fairly easily. Bad guys use a special device to crack the remote code. You can manually reset a code in an older system. Learn how to do this by finding the manual or checking the manufacturer’s website. Openers won’t work during a power outage unless they have battery backup. If your door opener doesn’t have a backup, it may be worth it to upgrade to one that does. When the electricity goes out on a system without batteries, the only way to open a heavy garage door is by hand. Not everyone will be able to do this. Some people may find it difficult to disengage the opener and then lift the door. For these people, a backup will provide peace of mind. Does your garage door have an external keypad? A keypad allows you to enter a code to open the door from the outside. This is a handy feature if you’ve forgotten your remote or house keys. The newest keypads use fingerprint detection. No code required! Give us a call if you’d like to upgrade your opener. Ponderosa has been serving southwest Washington and the Portland, Oregon area for years. We’d be happy to give you an estimate for the repair or replacement of your garage door opener.